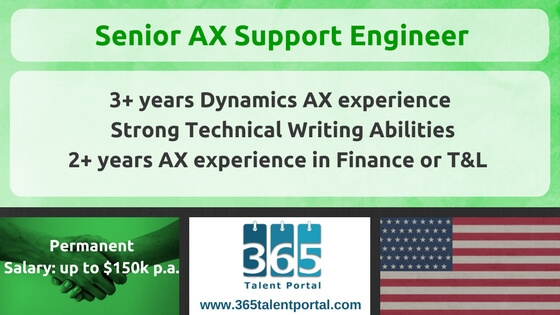 We are looking for a candidate to fill the Microsoft Dynamics Senior AX Support Engineer job for an award-winning Microsoft Dynamics Gold Partner. Salary: 80000 – 150000 USD p.a. Our client is looking for a highly motivated, honest and organized person to join their Client Services team. The award-winning Microsoft Gold Dynamics Partner are looking for an experienced individual who will be responsible for providing solutions to their clients’ technical support issues within Microsoft Dynamics AX. They’re looking for someone who is passionate about process improvements, detail oriented and self-driven. Participate in 24/7 support rotation. To get notified of Microsoft Dynamics positions that suit you, please .